I got a note today which made me feel slightly uneasy. 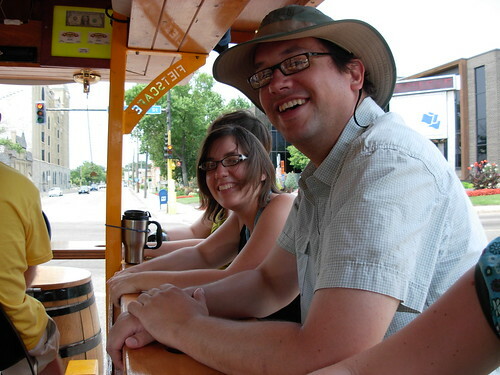 "Minneapolis City Councilwoman Lisa Goodman is beginning hearings on the fate of the PedalPub in Minneapolis this upcoming Monday, August 11 at 2:30pm. " What's up with that? What's going on with the fate of the PedalPub?? I'm not sure, but I'm writing this blog entry to show my support for the PedalPub. I'm totally smiling on the PedalPub! What is the PedalPub?? PedalPub was created in the Netherlands, and Minneapolis is home to the only PedalPub in the United States. It's a huge, 10 person bike with one steering wheel. Your crew makes merry while you all pedal along a designated route. A sober and experienced PedalPub employee steers the rig and is in charge of the brakes. Your crew provides the power and the drinks, snacks, and jams. Last weekend, we took the PedalPub out along the Nord'East route. We all showed up at the 1029 Bar at 2pm, and received some basic training from the PedalPub employee. We showed our IDs and signed our waivers. Then, we all hopped aboard and started pedaling. It's immediate fun; the sound of the gears whirling, the laughs, the music, the breeze in your hair, and even the pain in your legs as you pedal uphill. A change to Minnesota State Law effective May 16, 2008 allows passengers aboard the PedalPub to consume alcohol while aboard the PedalPub, which is rad - you can pack a few cold ones for the trip. We chose to stop at Tony Jaros' River Gardens, Grumpy's NE, and Mayslack's along the way. Our ride lasted about 3 hours with those 3 stops. Spectators waved, hooted, took photos, and smiled at us along the route. I was able to spend some of gerg's hard earned cash in 3 bars that I've never visited before, but the best part was good times with friends in a little neck of the non-woods. Interested in helping the PedalPub preserve its future in Minneapolis? Take a moment from your busy day to write to your City Councilwomen Lisa Goodman and Elizabeth Glidden; share with them your positive stories about the PedalPub. Aaahhh! Sometimes this state drives me crazy. I love living here and all, but first this text message ban and now a threat to the Pedal Pub. We should not accept the government arbitrarily making laws without facts! I'm pro-PedalPub and I vote. 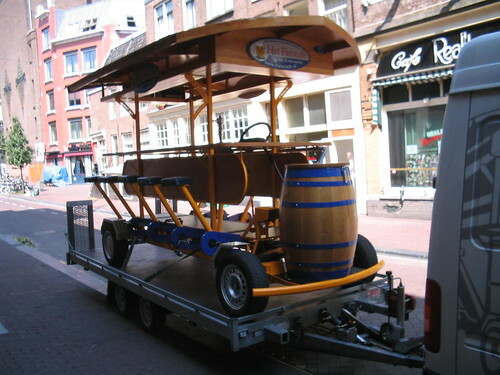 I love this idea...unfortunately, they are not my congress people--but I'm 100% pro Pedalpub. Alexis, ed, melina - No word yet on what, if anything, has happened to the PedalPub. I'll post results when I hear something.